A racing game based on the famous Dakar Rally. This game is based on the official license, which allows the players to assume the role of a driver from a real racing crew and drive an off-road car, a truck, ride a motorcycle or a quad. Dakar 18 is a rally game for PC, PS4 and XONE. The game was developed by Bigmoon Entertainment, known for working on such projects as Trapped Dead: Lockdown and Demons Age. 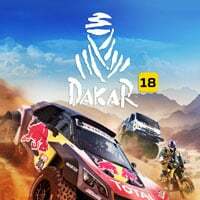 Dakar 18 was published by Deep Silver who own the rights i.a. to Metro series. Dakar 18 for PC, PS4 and XONE is a realistic simulation of the off-road race organized by Amaury Sport Organisation. There are different vehicles participating in this race, ranging from quads, and motorcycles, up to trucks. In total, there are five different vehicle categories one can choose from and race on a large open map. According to developers, this is one of the largest motor vehicle sandboxes available. Players are tasked with completing the race in the shortest time possible. This rally is extremely difficult, thus often just reaching the finish line can be considered a success. The game is based on the Amaury Sport Organization license, thus players can drive as members of real crews and compete against famous drivers.